Ten-year oyster eating champion, Colin Shirlow from Dromore, Northern Ireland finally faced defeat at this year’s Turkish Airlines World Oyster Eating Championship which took place on Saturday 3rd September 2016. Out-eaten by US Contender Michelle Lesco at the Hillsborough International Oyster Festival, Michelle managed to knock Colin off his throne by eating 227 oysters in three minutes and defeated fellow American Adrian ‘The Rabbit’ Morgan. Although Colin remained top of the leader-board for so long, it’s hardly surprising that Michelle managed to overtake him. A regular at professional eating competitions in the States, Michelle managed to put away 385 oysters in 8 minutes at the Acme Oyster Eating Competition in New Orleans earlier this year. Winner Michelle has taken part in countless eating competitions including ribs, hotdogs and hamburgers. 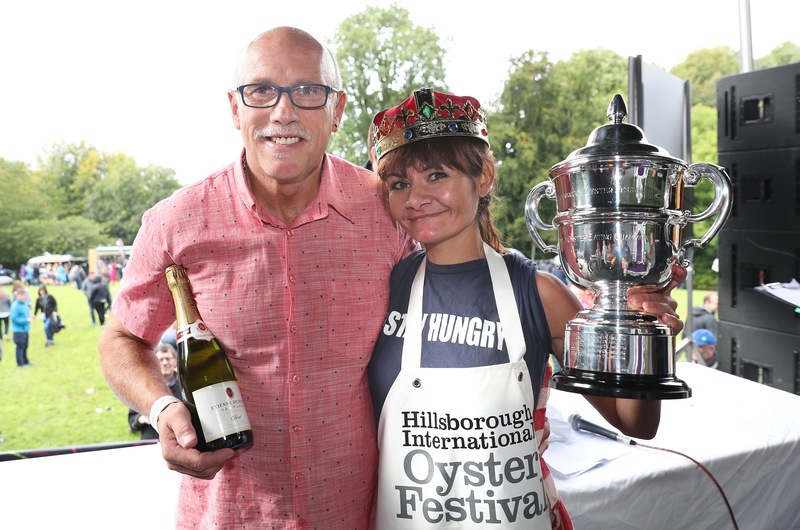 The Turkish Airlines World Oyster Eating Championship was attended by thousands of people as part of the Hillsborough International Oyster Festival. Other events included the Phoenix Natural Gas Soapbox Derby which featured a superb range of soapboxes and entertained the crowds and the first Northern Irish heat of the British Street Food Awards. This was another close contest which saw the public vote going to Pheasant Hill and judges Richard Johnson and Paula McIntyre’s votes going to Broughgammon Farm. These two street food retailers will now go on to represent Northern Ireland in the final of the British Street Food Awards in Birmingham. The Hillsborough International Oyster Festival also kindly acknowledges the support of Tourism Northern Ireland and Lisburn & Castlereagh City Council in the staging of this year’s event. The event welcomed guests from the Hillsborough area and further afield, as well principal Festival sponsors Turkish Airlines, Phoenix Natural Gas, Quilter Cheviot and Charles Hurst. For further information on the Hillsborough International Oyster Festival visit http://www.hillsboroughoysterfestival.com.